We are pleased to present this Chevrolet SS Sprint Cup Car. 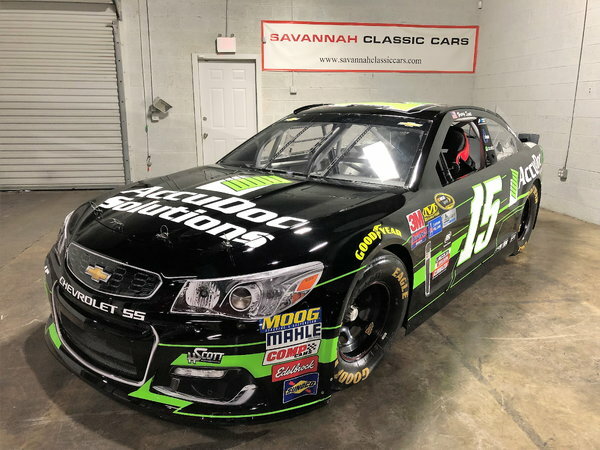 This is one of 38 cars produced for H Scott Motorsports to be driven by Clint Bowyer. The team shut down their Cup and K&N teams just prior to the season leaving these cars empty. This particular car was given a crate 355hp small block Chevy engine and Jericho 4 speed manual transmission then taken to be stored among Henry Scotts personal collection. The carbon fiber exterior of the car is in new condition as it has never been raced. This will make for a very interesting piece for any NASCAR fan's mancave or an especially fun and different track day car. We can coordinate shipping to your location. Please contact or text Savannah Classic Cars at 912-235-2347 for more information.